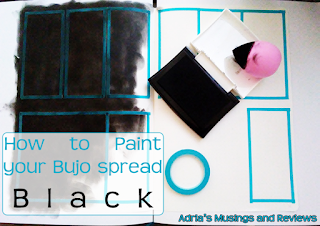 Adria's Musings and Reviews: How To: Color Your Bujo Pages Black. 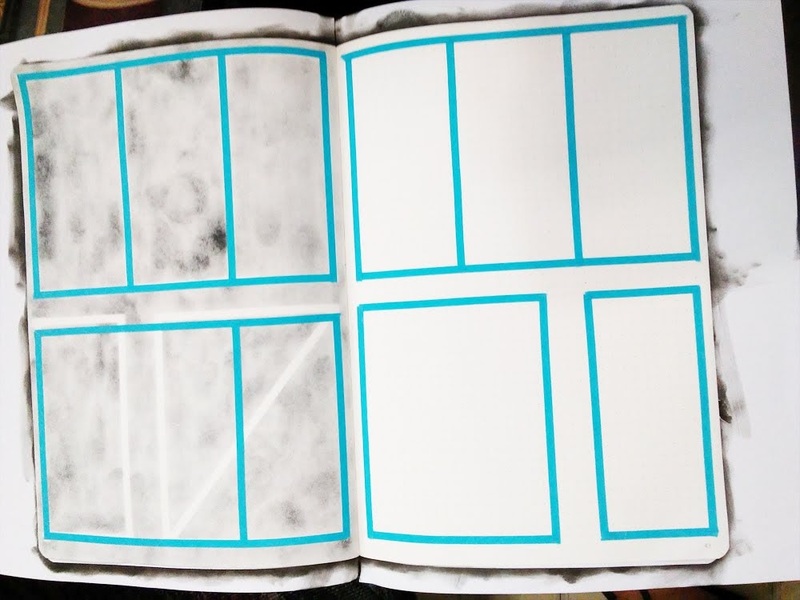 I’m trying to stay way ahead on planning my bullet journal spreads and I am working on October right now. Since Halloween is in October I thought I’d have a goth/Halloween month which to me meant black pages! I had no idea how to do this but I got an idea while checking out The Petite Planner's instagram. She used an ink pad and a beauty blender to get her black spread but there was no tutorial for them. That’s okay though, she already provided what she used to color the page so I figured the rest out myself. So if you want to do a black layout here is how I did it and what I found out after I did the first week’s spread. Your notebook (I’m using the Leuchtturm1917 soft cover 7x10 in. which I found at Barnes and Noble but you can order it off of Amazon). 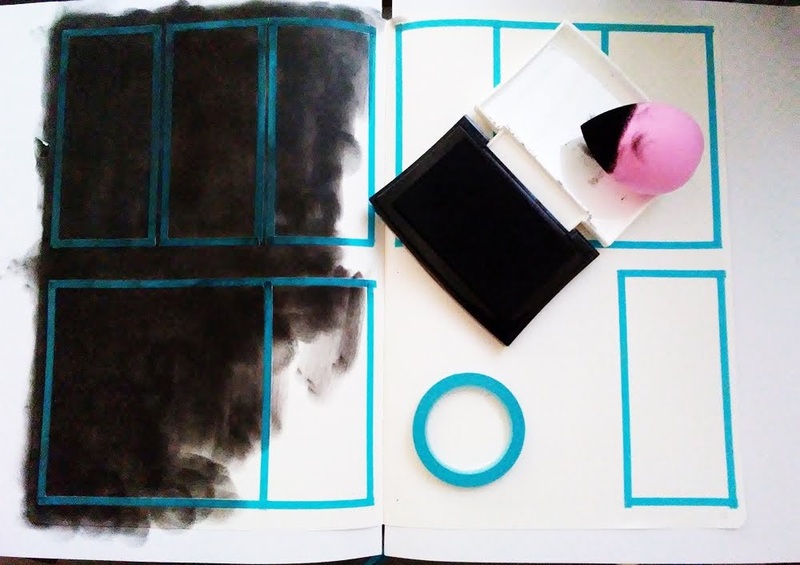 An ink pad of whatever color you use. I would suggest using a waterproof ink because if it isn’t waterproof then it will smear if you use a water based marker like Tombow. I am using Versafine pigment ink in Onyx Black. I bought it at JoAnns but again, you can order it off of Amazon. Patterning Tape. I got mine at Michael’s but it can be found on Amazon. It comes with 2 rolls in 1/8 in width and ¼ width. I used the thinner of the two. Beauty Blender or Foundation Sponge. The beauty blender can be a bit pricey but the sponges can be bought in a pretty large pack at your local drug store. Gloves because I quickly learned that it could get messy! 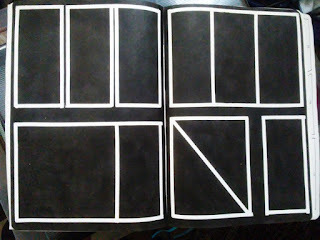 Scrap paper to put under each page so that you don’t end up coloring any other pages you don’t want to. Tombow Mono Removable Adhesive. Make sure it’s the removable one! I get mine at Michael’s but here’s the Amazon link. 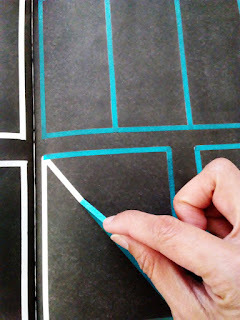 Steps 1 & 2: Using the patterning tape, “draw” your boxes or whatever shape you have planned. 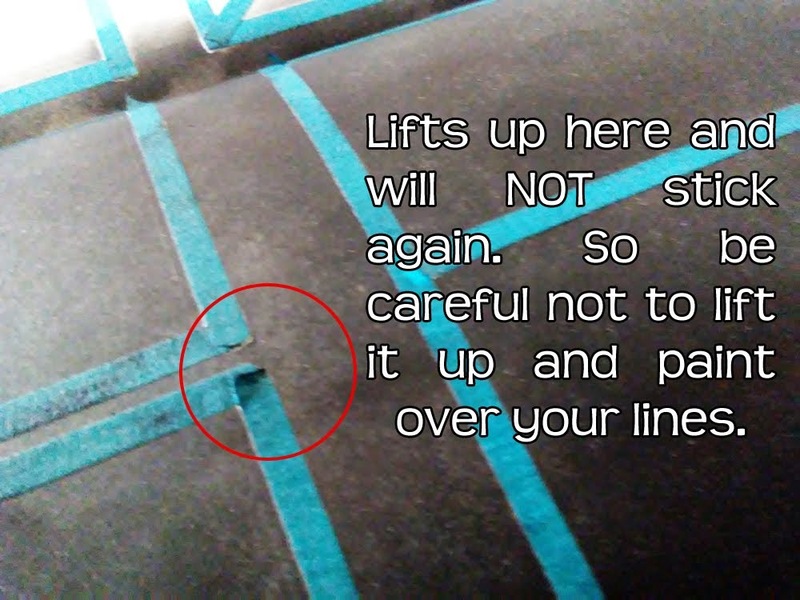 Make sure you press down on the tape so that it doesn’t move when you’re painting over it. That’s the easy part. 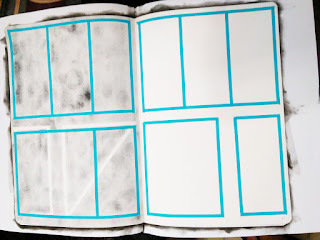 Take your scrap paper and tape it with the removable adhesive to the backs of the pages that you’re going to be painting on, this will keep you from painting the edges of the other pages. Now I used both the beauty blender and the regular foundation sponge and honestly I liked using the sponge better. They both hold the ink pretty well but I took longer with the beauty blender and it stained my fingers pretty bad. 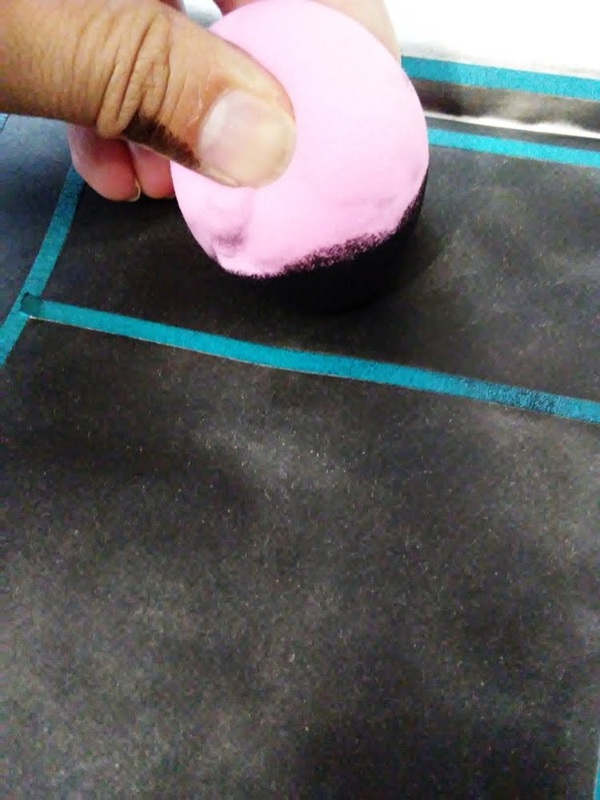 Step 5: Dab your blender or sponge into your ink pad. I don’t press down hard because it will absorb too much ink. 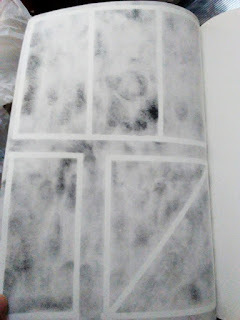 Anyway, start painting your page, I start with downward strokes first and as the sponge ran out of ink I switched to putting a bit of pressure on the sponge to get the excess off. Repeat as needed until your pages are completely covered. Tip: Make sure your strokes follow the direction of the tape as much as you can. I say this because if the ends of the tape lift up you won’t be able to get them to stick again and you will probably end up painting over a part you didn’t want to paint. Step: 6 Let it dry completely. I left mine to dry over night the first time but realized that it doesn’t need that much time. The second time I gave it like 2-3 hours just to be sure. Step 7: Finally, the moment of truth. 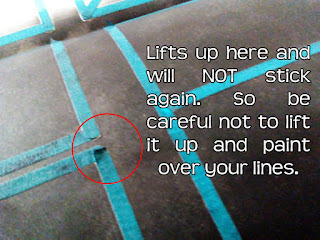 Carefully peel off the patterning tape. I say carefully because I tore a few inches here and there while removing it. Ta da! It’s done. 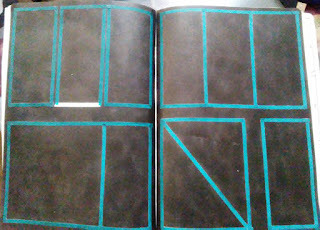 Now in my case I noticed that I had a few spots that I wanted to color in just to make my boxes look more even. I just put a few small strips of patterning tape on and painted it. Do not try to free hand it, it won’t work unless you have a very small sponge you can control. Note: There IS a bit of bleed through depending how much ink you put on the page. In my case it's fine because I'm doing back to back black spreads for the whole month of October. 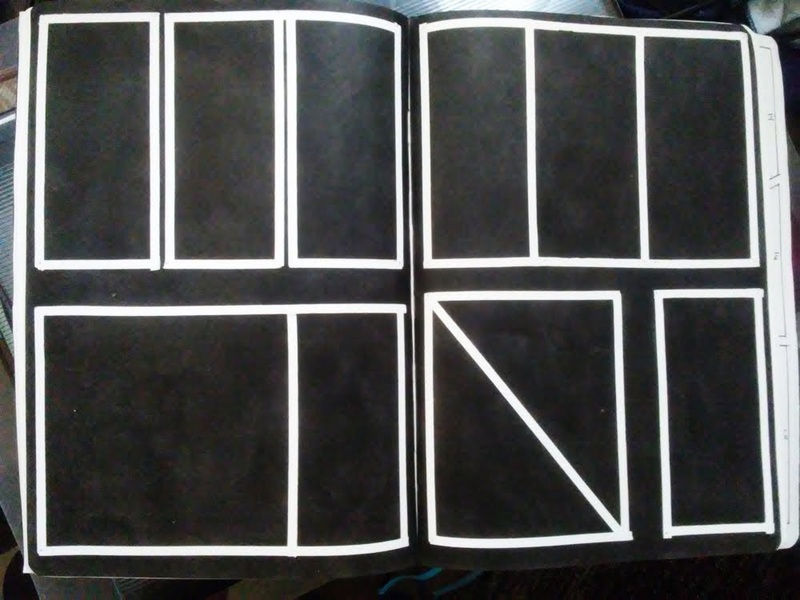 I tested out my new black pages using three white pens/markers. The first was the ranger brush pen in white which was okay but didn’t show like I wanted it to. 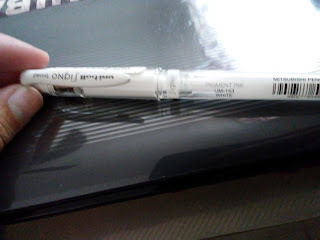 The second was the sakura jelly pen in white which was better but still not what I wanted. The winner was the uni-ball signo broad pen in white. OMG I LOVE THIS PEN! It’s exactly what I was looking for and I need to get another one ASAP. 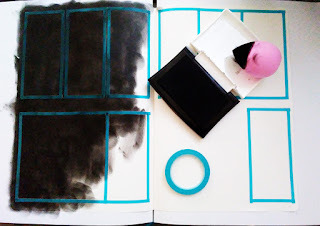 As of this post I also purchased waterproof dark blue and waterproof green ink pads so I will be painting some more spreads in the future just to test them out. 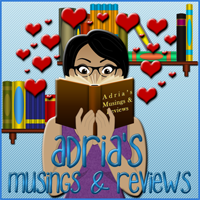 If you have any questions, please feel free to ask. If you have any tips you'd like to share, please do I love learning new and better techniques.